Thousands of protesters have turned out in Washington and San Francisco to demonstrate against the occupation of Iraq by the United States-led coalition. 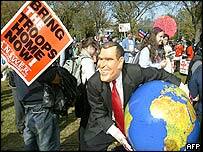 In the capital, about 20,000 gathered at the Washington Monument, within sight of the White House, carrying posters calling for the withdrawal of US troops from Iraq. They also called for the repeal of the US Patriot Act - wide-ranging legislation that was introduced as part of the campaign against terrorism following the 11 September attacks. The BBC correspondent in Washington says the demonstration reflects the mood of many Americans, who are becoming increasingly concerned about the cost of the occupation and the rising number of casualties. "I came to show support for our brothers, here and in Iraq." The Washington protesters carried placards with slogans such as "Make jobs not war", and "Bush is a liar". The protests on both coasts were organised by the group Answer (Act Now to Stop War and End Racism) and United for Peace and Justice. Bill Nelson, a bookshop owner from Burbank in California, was one of hundreds who took to San Francisco's sunny streets for a much smaller rally. "We feel it's very important to keep our voices heard because we want our troops home," he said. "We want the money here for health care and jobs, not a military industrial complex." The Washington protest drew a diverse crowd of young, old, veterans, American Muslims and relatives with loved ones in the armed forces. They carried posters saying "UN in, US out", and "Thou shalt not covet another's country" as they marched towards the White House and the US Justice Department. The Reverend Al Sharpton, a black activist and presidential candidate, urged demonstrators not to be content with the gradual withdrawal of US forces from Iraq. "Don't give Bush $87bn [for Iraq], don't give him 87 cents, give our troops a ride home," he said. President Bush himself was away at the Camp David presidential retreat in Maryland for the weekend. The march was thought to be smaller than the mass demonstrations before and during the war. But the BBC's Jon Leyne, who was at the Washington rally, said it was probably more in tune with the mood of Americans, who are increasingly concerned at the president's policy in Iraq. However, to counter the anti-war demonstrations, dozens of people attended a simultaneous rally in the capital organised by the conservative Washington chapter of Free Republic. "Whether or not the war should have started is a moot point," said 32-year-old Eric Campbell, who served in the 1991 Gulf War. "We have to stay if anything for the Iraqi people." "The first major peace protest since the end of the war"